United Kingdom 2006 "150th Anniversary of the National Portrait Gallery"
The National Portrait Gallery houses an immense collection of portraits featuring some of Britain's most significant subjects. With 9,000 portraits of famous men and women and boasting a phenomenal archive, library and technology gallery the NPG acts as a pictorial "Who is Who" of British history. 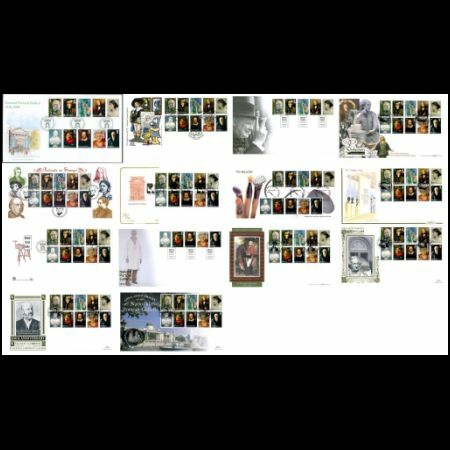 The images selected for the stamps are drawn from a full historical time span, and show a balance of people from different areas of life including a politician, a writer and an artist. The stamps also show the wide variety of different media that are exhibited in the gallery such as portraits in sculpture, watercolour, oil painting and photography. Royal Mail's design team worked closely with the NPG to establish a final shortlist which was passed on to designer Peter Willberg, who has previously worked on the 2005 Jane Eyre issue featuring Paula Rego-s haunting lithographs. 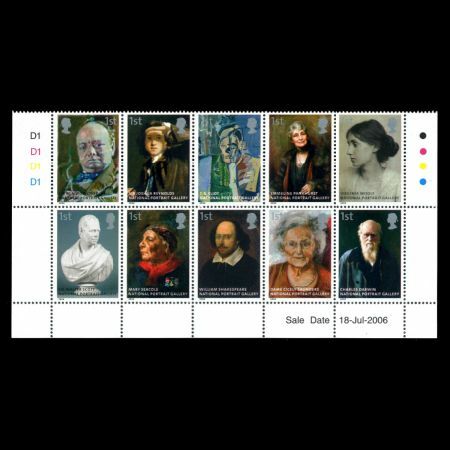 Included in the stamp issue is the most famous image of William Shakespeare, which has a special significance as it was the first portrait the Gallery acquired. Also featured are less well known images, such as the charming portrait of Marry Anne Seacole and the rare oil painting of Emmeline Pankhurst. To keep the labelling as simple and uncluttered as possible, the stamp features the name of the subject and the name of the gallery. 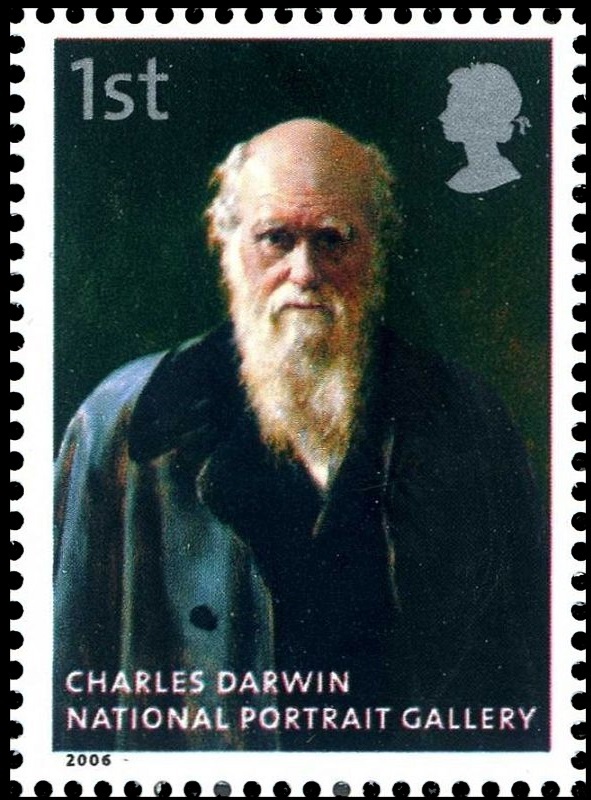 Charles Robert Darwin (1809-1882), naturalist, geologist and originator of the theory of evolution. Sitter in 30 portraits. It is most fitting that this portrait of Sir Joshua Reynolds be included as he was the first President of the Royal Academy, and his annual -Discourses- to the students remain an important component in the teaching of artistic history. Reynolds was more responsible than any other for raising the status of artists in Britain. 1st Class - TS Eliot Heron's semi-Cubist portrait of Eliot is both stylistically innovative and intellectually demanding, much like the author himself. Elliot is known for classic works such as The Waste Land, The Cocktail Party and Old Possum-s book of Practical Cats, a book of light verse, which was the basis of the Musical show Cats. Founder of the Women-s Social and Political Union with her daughter Christabel, Emmeline Pankhurst was the leader of the militant movement for women-s suffrage. She was imprisoned for her beliefs and actions on several occasions, as was the portrait-s painter, Georgina Agnes Brackenbury, who was also involved in militant suffrage activity. 1st Class - Virginia Woolf The only photograph in the set, this was taken in 1902, just as she was embarking on her career. It is unusual as she was normally averse to sitting for portraits and being pictured. The photo shows her looking pale and contemplative. 1st Class - Sir Walter Scott This bust of Sir Walter Scott was the result of several sittings by the renowned novelist and poet for the sculptor, Sir Francis Leggatt Chantrey. The sittings were appropriately social occasions which always included breakfast, and when it was finished Chantrey presented Scott with the marble as a token of his respect and friendship. The most recent painting in the set, Dame Cicely sat for this portrait over 22 times, many of which were during her struggle with cancer. As founder of the hospice movement her contribution is without doubt, and she is a modern addition to this collection of our country-s most significant faces. Special postmarks announced for the Day of Issue. 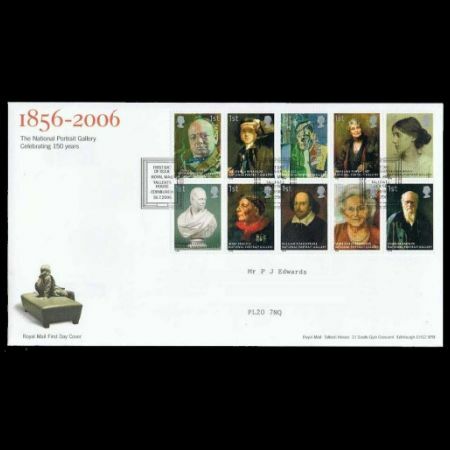 Royal Mail will produce special postmarks for the issue date. First day of issue: Tallents House, Edinburgh Ref No FD 06 25 As an alternative to the Tallents House, Edinburgh postmark, pictorial and non-pictorial (plain design) LONDON, WC2 postmarks will also be available for this issue. 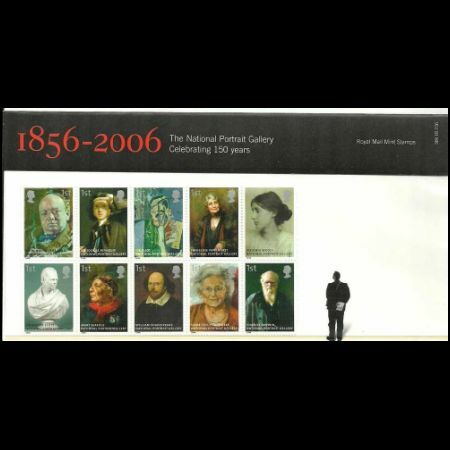 National Portrait Gallery is the full title of the 18 July 2006 issue and LONDON, WC2 chosen as the postmark because it is the location of the gallery. All first-day-of-issue postmarking offices will be supplied with the alternative pictorial first-day-of-issue postmark. This will mean that all first day covers posted at the Post Office- counter will be cancelled with the same pictorial postmark regardless of where they are posted. The First Day Cover Envelope was designed by Andrew Ross and printed by Smurfit Print UK. The filler card was also designed by Andrew Ross with photography by Nick Turpin and written by John Cooper. It is printed by Fulmar Colour Printing Company Ltd. 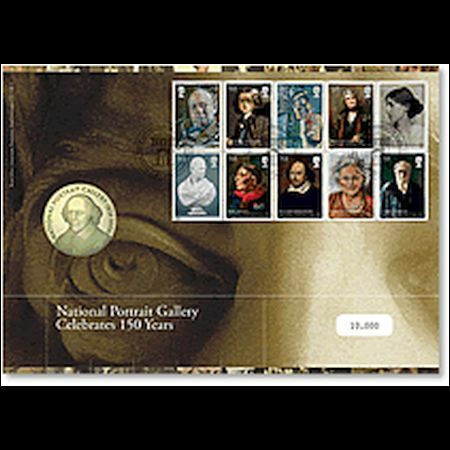 The fully illustrated Presentation Pack comprises a full set of the ten National Portrait Gallery stamps. The pack was designed by Andrew Ross with typically enigmatic photography by Nick Turpin and written by John Cooper. The Pack is printed by Walsall Security Printers. Limited in number these unique Medal Covers are designed with the collector in mind. This pack features a specially commissioned and distinctively designed medal approved by the National Portrait Gallery, to mark its 150th anniversary. The medal itself features a portrait of Shakespeare on one side and an edited version of the Carlyle quotation on the other.